Galilee (Hebrew: הגליל ha-Galil, lit: the province, Latin: Galileia, Arabic: الجليل al-Jaleel) is a large place in northern Israel. It is traditionally divided into Upper and Lower Galilee. It is mentioned frequently in the New Testament. 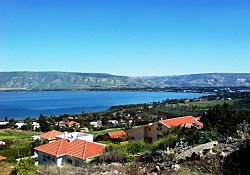 Most of Galilee consists of rocky terrain, at heights of between 500 and 700 m. Several high mountains are in the region, including Mount Tabor and Mount Meron, which have relatively low temperatures and high rainfall. As a result of this climate, flora and wildlife thrive in the region, while many birds annually migrate from colder climates to Africa and back through the Hula–Jordan corridor. 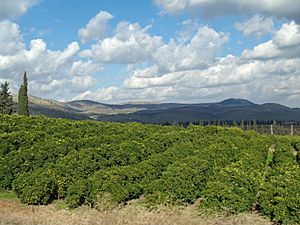 The streams and waterfalls, the latter mainly in Upper Galilee, along with vast fields of greenery and colourful wildflowers, as well as numerous towns of biblical importance, make the region a popular tourist destination. Due to its high rainfall (900–1200 mm), mild temperatures and high mountains (Mount Meron's elevation is 1,000–1,208 m), the upper Galilee region contains some distinctive flora and fauna: prickly juniper (Juniperus oxycedrus), Lebanese cedar (Cedrus libani), which grows in a small grove on Mount Meron, cyclamens, paeonias, and Rhododendron ponticum which sometimes appears on Meron. 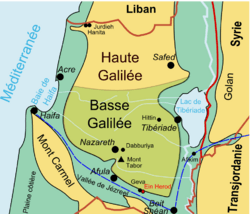 According to the Bible, Galilee was named by the Israelites and was the tribal region of Naphthali and Dan, at times overlapping the Tribe of Asher's land. However, Dan was dispersed among the whole people rather than isolated to the lands of Dan, as the Tribe of Dan was the hereditary local law enforcement and judiciary for the whole nation. 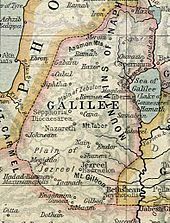 [non-primary source needed] Normally, Galilee is just referred to as Naphthali. In Roman times, the client kingdom of Judea was divided into Judea, Samaria, the Paralia (Palestine), and Galilee, which comprised the whole northern section of the country, and was the largest of the three regions under the Tetrarchy (Judea). After Judea became a Roman province in 6, C.E., Galilee briefly became a part of it, then separated from it for two to three centuries. The Galilee region was presumably the home of Jesus during at least 30 years of his life. Much of the first three Gospels of the New Testament give an account of Jesus' public ministry in this province, particularly in the towns of Nazareth and Capernaum. Galilee is also cited as the place where Jesus performed many public miracles, including curing a blind man. After the death of Jesus, some accounts suggest his disciples returned to Galilee and their experience of His resurrection took place there. Many of the important Tannaim, the Rabbinic sages whose views are recorded in the Mishnah and Talmud, claim to have also spent their lives there, including Honi Ha-Ma'agel, Jose the Galilean, and Ishmael the Galilean, among many others. Traditional rabbinic sources assert that the followers of the rabbis from the Galilee were widely reputed to believe their teachers (rabbis) were miracle workers, as opposed to those from Judea, Persia, and Babylon, who rarely are credited with miracles. Many are cited for their large number of students and followers throughout the Jewish people among the common people. The Galilee among the Jewish population was known as a wellspring of miracle workers and mystical philosophers of all types, especially just prior to the major split between Jesus' followers and those who opposed Jesus. According to the Talmud, one of the most important founders of the modern Jewish faith, Johanan ben Zakai, was born there. Simeon bar Yochai, one of the most famed of all the Tannaim, hid from the Romans in the Galilee, and dug tunnels there to hide. Many miracles are ascribed to him during his Galilean period after escaping Judea proper. In medieval Hebrew legend, he may have written the Zohar while there. The archaeological discoveries of synagogues from the Hellenistic and Roman period in the Galilee show strong Phoenician influences, and a high level of tolerance for other cultures, relative to other Jewish sacred sites from the period, the latter being "cleansed of impurities". Eastern Galilee retained a Jewish majority until at least the seventh century. 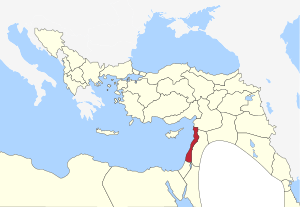 During Early Ottoman era, the Galilee was governed as the Safad Sanjak, initially part of the larger administrative unit of Damascus Eyalet (1549-1660) and later as part of Sidon Eyalet (1660-1864). During the 18th century, the administrative division of Galilee was renamed to Acre Sanjak, and the Eyalet itself became centered in Acre, factually becoming the Acre Eyalet between 1775 and 1841. In mid-17th century Galilee and Mount Lebanon became the scene of the Druze power struggle, which came in parallel with much destruction in the region and decline of major cities. During the 1970s and the early 1980s, the Palestine Liberation Organization (PLO) launched several attacks on towns and villages of the Upper and Western Galilee from Lebanon. Israel initiated Operation Litani (1979) and Operation Peace For Galilee (1982) with the stated objectives of destroying the PLO infrastructure in Lebanon and protecting the citizens of the Galilee. Israel occupied much of southern Lebanon until 1985, when it withdrew to a narrow security buffer zone. 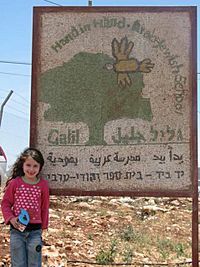 Until 2000, Hezbollah, and earlier Amal, continued to fight the Israeli Defence Forces, sometimes shelling Upper Galilee communities with Katyusha rockets. In May 2000, Israeli prime minister Ehud Barak unilaterally withdrew IDF troops from southern Lebanon, maintaining a security force on the Israeli side of the international border recognized by the United Nations. However, clashes between Hezbollah and Israel continued along the border, and UN observers condemned both for their attacks. The Jewish Agency has attempted to increase the Jewish population in this area, but the non-Jewish population also has a high growth rate, As of 2006[update], there were 1.2 million residents in Galilee, of which 46.9% were Jewish. The Galilee is famous for its olives, pomegranates, wine and especially its Labneh w'Za'atar which is served with pita bread, meat stews with wine, pomegranates and herbs such as akub, parsley, khalmit, mint, fennel, etc. are common. Galilean kubba is usually flavored with cumin, cinnamon, cardamom, concentrated pomegranate juice, onion, parsley and pine nuts and served as meze with tahini dip. Kebabs are also made almost in the same way with sumac replacing cardamom and with carob sometimes replacing the pomegranate juice. Because of its climate, beef has become more popular than lamb, although both are still eaten there. Dates are popular in the tropical climate of the Eastern Galilee - like rest of the eastern parts of the country. Galilee Facts for Kids. Kiddle Encyclopedia.